Our high-luminance and long-lasting glowing phosphorescent product uses original C.I. TAKIRON inlaid molding, which has a thick phosphorescent layer combined with a reflective base layer. It offers excellent phosphorescence, maintaining luminance even after 12 hours of darkness. There is a diverse range of products that caters to different uses. 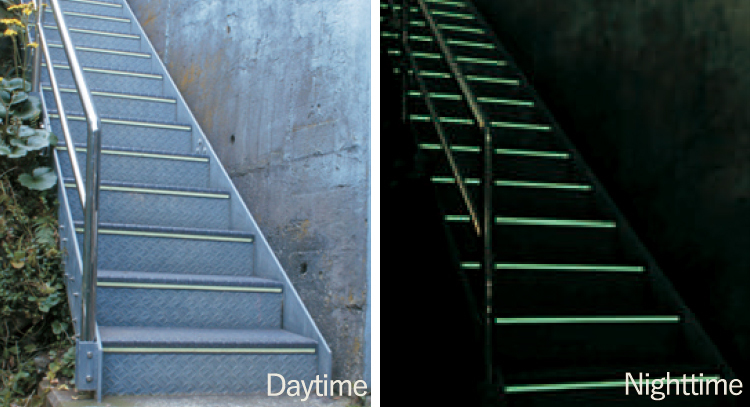 This product helps people see the stairs in the dark, with its phosphorescent lines on the stair nosing, tread, and riser . 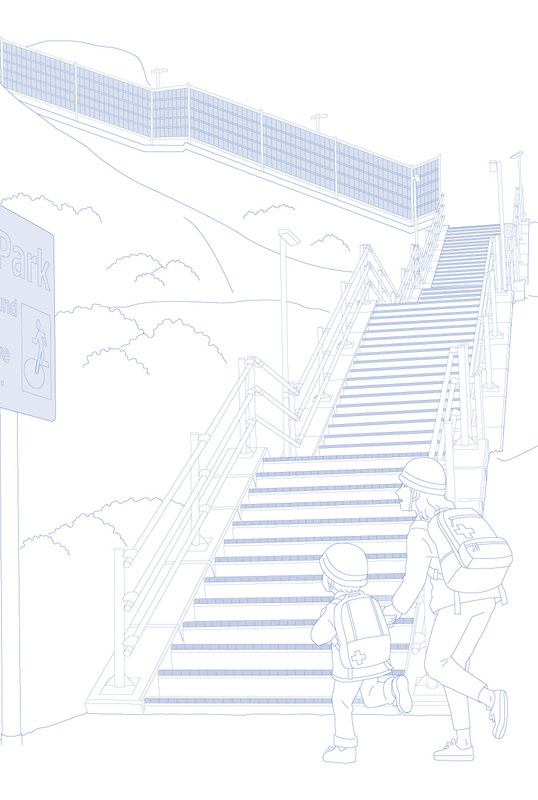 It has excellent slip-resistant properties and is optimal for indicating vertical evacuation routes clearly in the event of tsunamis or sudden rainstorms. 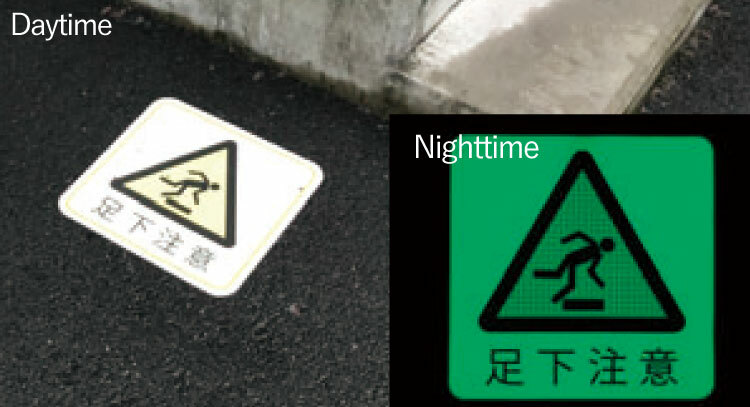 Extra-bright and long-lasting phosphorescent signs that provide reliable evacuation guidance in darkness outdoors or during power outages. They are based on C.I. 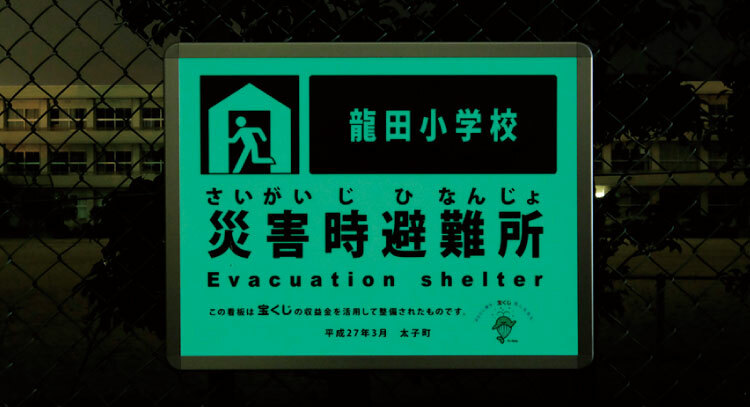 Takiron’s unique flexible phosphorescent sheet, and can be used for various evacuation signs and outdoor advertising/guidance items. 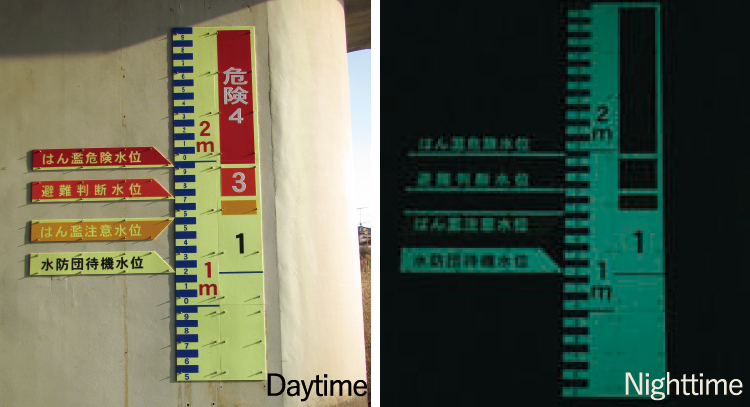 Signs on piers and river/seawalls are used to gauge water or tide levels. 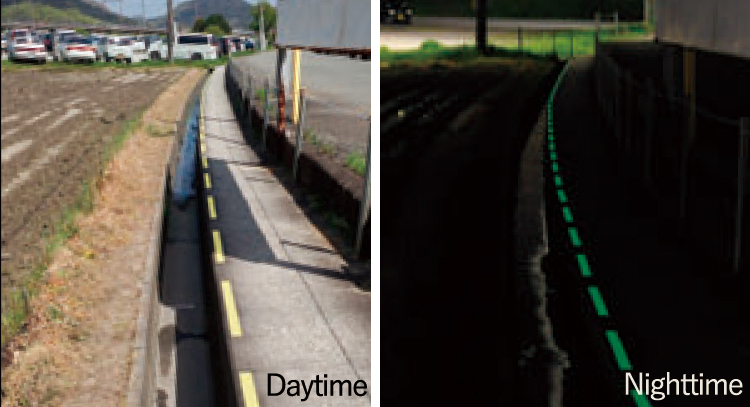 Phosphorescent sheets can ensure safety by helping people stay on pedestrian paths and slopes at night. Phosphorescent display material which can be made with various designs and can be easily installed on walls and floors. We have combined technology and know-how that C.I. TAKIRON has built up over the years with the features of plastics, namely lightweight, resistance to heat, shock, and friction, and ease of molding and processing. 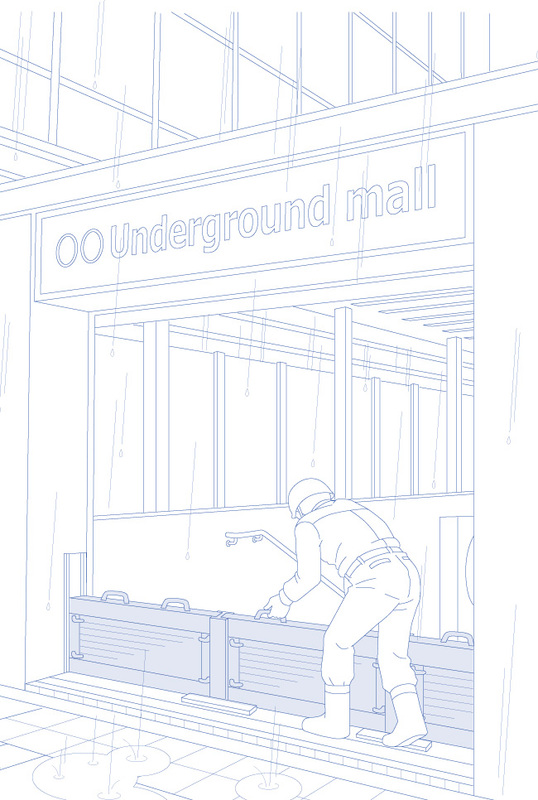 The Light-weight Waterproofing Panels protect important assets from water damage, such as flooding from sudden rainstorms, with its excellent water-blocking properties. Also, its lightness allows for easy installation. 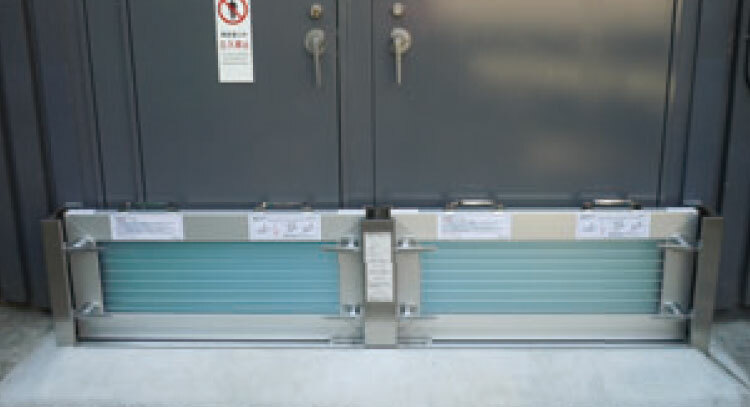 Waterproofing panels that can be installed for elevators with underground drive units. 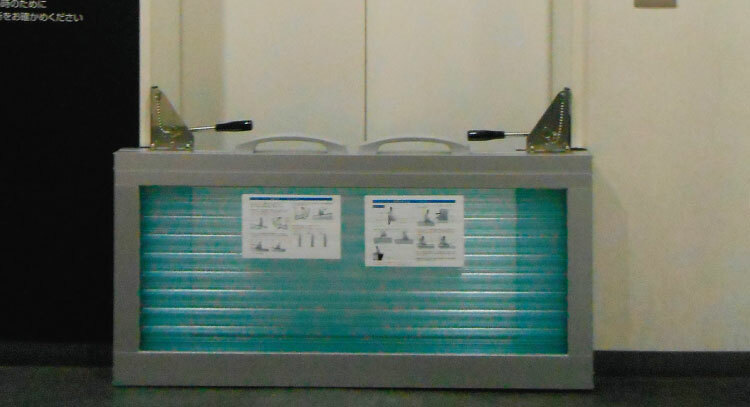 Waterproofing panels that are easy to install and will instantly protect building lifelines in emergencies. 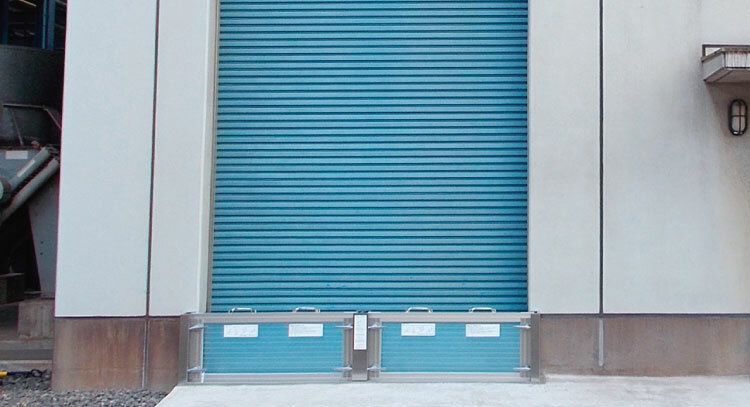 Waterproofing panels that can be connected together for use in wide entrances such as at factories.